Earlier this week, the Alliance for Women in Media Foundation handed out the 42nd Annual Gracie Awards at a luncheon at Cipriani on 42nd in New York City. Host Dylan Dreyer led the program alongside presenters Bevy Smith from Bravo’s “Fashion Queens,” Larry Mullins from CBS Radio’s 1010 WINS, Christine Nagy from The Bob and Christine Show, and Erin Moriarty, CBS “48 Hours” correspondent. The Gracie Awards were presented to honorees which were previously announced (view full list of honorees here) in recognition of individual achievement and outstanding programming by, for and about women in local and student TV, radio and interactive media. •	Host Dylan Dreyer, weather anchor of NBC News’ “Weekend TODAY” and regular co-host for TODAY, opened the awards with a story of how she grew up with all brothers and wasn’t intimidated being one of two women in her meteorology program. •	After sharing her inspiring and personal story of beating breast cancer, songwriter Kara DioGuardi shared how she wrote the song Sober with Pink. She then performed the song as well as the Kelly Clarkson collaboration Walk Away. 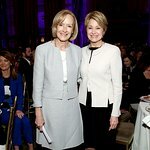 •	“Jane conducted herself in Chicago with tremendous dignity and developed a kind of respect among her peers that she has developed among her colleagues for her entire career,” said Teichner.